SAN DIEGO, CA, Aug. 19 /CSRwire/ - Further demonstrating its commitment to operating a socially and environmentally responsible business, Chicken of the Sea is releasing its 2014 corporate sustainability report. The report focuses on the company’s four pillars of sustainability: facilities, employees, products and suppliers. Since 2011, Chicken of the Sea has collected comprehensive data on practices throughout the organization and its supply chain. The company tracks progress toward its sustainability goals in the areas of energy, waste, water, health and safety, and supply chain. Additionally, in 2014, Chicken of the Sea celebrated its centennial anniversary and initiated its largest corporate social responsibility engagement campaign in the company’s history. As part of its 100 Years of Good celebration, Chicken of the Sea donated $1 million to nonprofit organizations and individuals across the U.S. who give back to their communities. The company also launched the Mermaid Legacy Fund, which creates a mechanism for the ongoing donation of money, volunteer hours and other resources to nonprofit organizations. 20 percent reduction in electricity and natural gas use (per standard case) by 2020 – With a 6.5 percent decrease in the amount of electricity from 2012 to 2014, Chicken of the Sea is on track to meet its 20 percent reduction goal. However, during the same period of time natural gas use increased by 21.6 percent on a production-adjusted basis and is now one of the company’s top environmental priorities. Chicken of the Sea started working with an energy specialist in 2015 to create an action plan to optimize the use of natural gas. 30 percent reduction in landfill waste (per standard case) by 2020 – Since 2012, Chicken of the Sea experienced a 50.5 percent decrease in the amount of waste it takes to produce a case of product, far surpassing its goal. The company is now evaluating its progress made to date and determining what additional improvements can be made in the coming years. 15 percent reduction in water use (per standard case) by 2020 – Over a two-year period, Chicken of the Sea saw an 11.6 percent decrease in the amount of water it takes to produce a standard case of product. Chicken of the Sea is investing in a variety of water conservation measures, including using new technologies, reducing point-of-use water and increasing water recycling. Maintain or reduce safety incidents by 2020 – Since the goal was set in 2012, Chicken of the Sea has seen a 63.6 percent reduction in the number of safety incidents, and averaged a 1.5 incident rate compared to the state of Georgia’s 4.4 average safety incident rate. The company continues to find ways to promote a culture of safety throughout its operations to maintain or reduce the number of incidents each year. Audit 90 percent of seafood procurement spend (on a three-year rolling basis) by 2020 – By the end of 2014, Chicken of the Sea had completed sustainability audits for 57 percent of its seafood vendors and suppliers and is on track to audit 80 percent by the end of 2015. Launched in 2013, the third-party audits look at the company’s suppliers’ labor and human rights performance, environmental management systems, and overall business practices. Chicken of the Sea will audit additional suppliers each year and re-issue audits every three years. Chicken of the Sea’s sustainability program is supported by Strategic Sustainability Consulting. 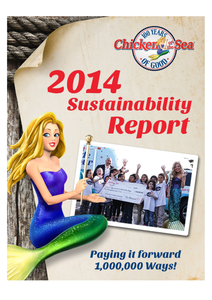 Chicken of the Sea’s full 2014 sustainability report is available at Sustainability.ChickenoftheSea.com. The past reports can be viewed at www.ChickenoftheSea.com/Sustainability. Founded in 1914, Chicken of the Sea (COS) is a leading provider of healthy, sustainable and delicious seafood, offering not only a robust product line but the recipes and meal-planning insights needed to inspire seafood lovers to greater culinary creativity and inspiration. The company provides tuna, salmon, clams, crab, oysters, shrimp, mackerel, kipper snacks and sardines in cans, cups and pouches as well as innovative new products consistent with seafood’s growing status as a healthy “new” protein choice in America. Headquartered in San Diego, COS sustainably sources its seafood products from around the world, and packages them at a state-of-the-art processing facility in Lyons, Georgia, as well as at third-party facilities. The company is led by a team of industry veterans with more than 300 years of collective experience in the packaged seafood industry. Strategic Sustainability Consulting (SSC) provides organizations with the tools and expertise needed to understand and manage their social and environmental impacts. Through sustainability assessments, green office auditing, supply chain management, stakeholder consultations, sustainability disclosure and social marketing, SSC helps organizations embrace their larger societal responsibilities and be the good corporate citizens to which they aspire. Find out more at SustainabilityConsulting.com.